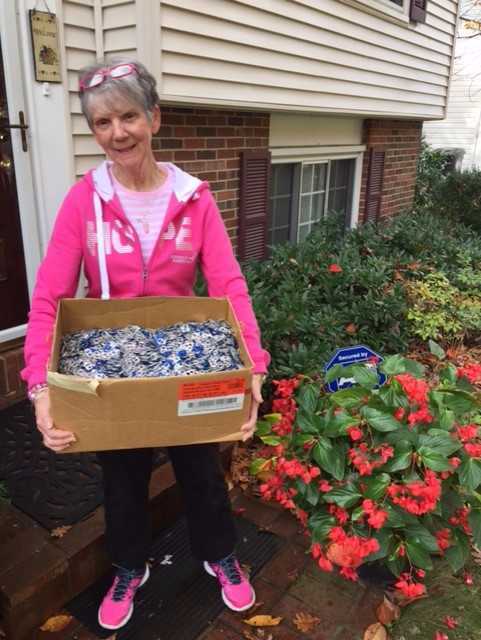 Last Friday afternoon, Mame Ward dropped off our latest “haul” of aluminum tabs to the Ronald McDonald House in Fairfax. The box of pull tabs totaled 14 pounds! The Ronald McDonald House pop top or pull tab program generates funds by selling the aluminum tabs to metal recyclers generating cash for the charity. Organizations like Sterling UMC support the program through collections of the tabs. The “Pop Top” program is one of a number of small ministries that SUMC supports through collections in our donation center located in the narthex. Since its inception in 1998, the Lions Eyeglass Recycling Center of Northern Virginia has sent over 700,000 pairs of glasses to vision-impaired people around the globe: that is over 1,000,000 children who can now read in school and adults who have the eyesight to lead normal, productive lives. Even your old eyeglasses can be recycled and help a child or a senior somewhere in the world! Another mission that helps serve our local Sterling community is the Box Tops and Soup Labels for Education. This effort serves the kids at Rolling Ridge Elementary by earning cash through the box tops and merchandise through Campbell’s soup labels. The Labels for Education program is coming to a close. Only UPCs with the Labels for Education logo will be accepted and redeemed for points into registered schools’ bank accounts. The deadline to submit and postmark UPCs into your school’s bank account is January 2, 2018. The box top program is still going strong and is an easy way to make a difference. Look for the Box Tops symbols on products. When you find them, cut them out and bring them to the donation center. Look for the bin marked Box Tops for Education. The school receives $.10 for each Box Top we collect. SUMC’s United Methodist Women also collect a variety of items to help our local community. Calendars and note pads are collected and brought to local senior housing. Toiletries and feminine hygiene products are collected and distributed through a number of local mission efforts including GRACE Ministry and Mobile Hope. And you can even recycle your postage stamps from your incoming mail. The UMW can turn those into cash that goes back to the United Methodist Church efforts. Bring those aluminum pop tops, your box tops for education, used postage stamps, hotel toiletries and feminine hygiene products, and calendars and note pads to the church. There are marked bins for each mission in the donation center closet in the narthex. If you have any questions just come by the office.